For some people online dating can be a great way to get to know someone without certain pressures. For others this can seem like a foolish way to meet people, and really doesn’t fit their personal goals or personality. Each person will respond differently to online dating and trying to find love in a much less old fashioned manner. 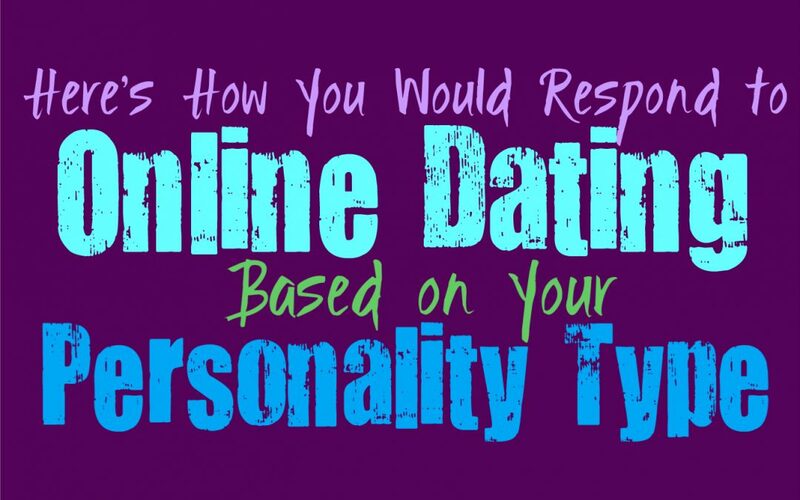 Here is how you would feel about online dating, based on your personality type. INFJs actually might benefit from online dating, since it helps them get to know someone without certain pressures standing in the way. INFJs can actually express themselves more openly and directly when they have the time to write things out. Being able to connect with another person this way can actually help them remove the more shallow aspects of dating which often put them off completely. INFJs might be hesitant to the idea of online dating at first, but ultimately it is something that can really help them uncover more about themselves and the person they are dating. ENFJs are often really outgoing people and so they are likely to prefer meeting people in person. For them finding people to connect with is something that happens naturally, and this is often what they prefer. Initially ENFJs might be hesitant to the idea of online dating but the busier they become the more intriguing the idea might be. When they become so caught up in all of their chores and tasks, finding the time to actually date might become difficult. In these situations online dating, at least at first, can be a useful way to weed out the people that aren’t really suitable for them. INFPs are introverts, ones who often prefer being on their own and can become weary of too much social interaction. Because of this they might not enjoy putting themselves out there and searching for someone to date. Online dating can be a way for them to connect with people without too many shallow distractions. For the INFP this is often the best way to get to know someone and figure out if they want to pursue a deeper relationship with them. It takes the pressure off in some ways, but also allows them to express themselves more comfortably. ENFPs are often outgoing people who enjoy allowing their relationships to occur more organically. They might be uncomfortable with the idea of online dating at first, since they might believe they can’t really get to know someone this way. Part of the ENFP might be hesitant to try something like this, especially since they can often meet people in person fairly easily. The ENFP who has been hurt or feels tired of the people they meet locally, might start to change their minds. They will likely be more open to prospects of online dating and the chance to find someone who actually understands them on a more sincere level. For the INTJ there might be some things about online dating which put them off a bit, but at the same time there are plenty of pros. They often analyze things like online dating and do research before actually giving it a try. INTJs like to be prepared for everything and that includes the process in which they decide to actually try dating. They are willing to wait it out before stepping into a relationship with someone, but that doesn’t mean they aren’t capable of searching for the right person. INTJs might benefit from online dating since it gives them a chance to get to know someone before wasting too much time with them in person. ENTJs don’t mind looking into their options and so while they might be hesitant at first, online dating might be an option for them. ENTJs strive for efficiency and often hope to find someone they can trust to share their lives with. If they are in a situation where they feel like they aren’t meeting the right people, they are often willing to attempt online dating, especially if it seems to have good results for others. The ENTJs can certainly benefit from online dating, but at the same time they can be a bit skeptical and might prefer the idea of meeting someone much more organically. INTPs can definitely benefit from online dating, and might prefer to meet new people this way. They can become so caught up in their own minds and personal space, that they don’t really get the chance to meet people organically. For the INTP it can be appealing getting to know someone without so many outside interference or expectations. Being able to connect with someone through text or phone, is a good way for them to open up more and really be able to feel comfortable sharing their thoughts and even occasionally their feelings. ENTPs are often outgoing and friendly people, but that doesn’t mean they won’t respond well to online dating. They often enjoy multi-tasking and sometimes this can make dating a little bit challenging. They might appear distracted to people who don’t really understand them, and so having the chance to get to know someone at their own pace can be beneficial. Online dating gives the ENTP a chance to get to know this person without having to be physically close to them. ISTJs can sometimes be old-fashioned people, and so the idea of meeting people online might seem a bit unusual to them. They are likely to be skeptical of it at first, but that doesn’t mean they cannot respond well to it. ISTJs can become truly busy with everything they have to do, and so sometimes meeting people can be a bit difficult. Online dating can give them to chance to meet new people and learn about them without too much pressure. For the ISTJ this can definitely be a helpful way for them to get to know someone, since they are introverts, but they might be a bit too skeptical of it. For the ESTJ something like online dating is rarely appealing, since they prefer to meet people their own way. They would often rather date in person since they feel like they can understand someone better this way. Most ESTJs are somewhat skeptical people and so they might be uncomfortable with change. If they are used to dating a certain way, changing their way of thinking is something that they aren’t likely to want. For ESTJs it is usually more beneficial to meet people on their own terms, but that doesn’t mean they can’t benefit from online dating. The biggest benefit for them is often feeling more at ease opening up to someone, since they don’t have to see them face to face. Most ISFJs are drawn to the things they are accustomed to, and so online dating might feel strange for them at first. If they are so used to dating people organically and meeting them in person, they will be hesitant to trying it a different way. ISFJs who can get past their initial reaction might actually enjoy getting to know someone new online. This can be especially beneficial for them if they have dealt with a break up which makes them feel nervous about dating once again. Some ESFJs might be used to the things they know and are comfortable with, but that doesn’t mean online dating can’t be beneficial for them. For an ESFJ who really hasn’t dated much, this can be a good way to get to know people. They might enjoy the chance to take things slower, without having to deal with the pressures of meeting someone organically. ESFJs will likely lean more towards online dating if they feel like they haven’t made real connections to people in person. The most beneficial aspect of online dating for the ISTP, is often the chance to get to know someone without feeling obligated quite so much. They enjoy having plenty of time to themselves and become drained by constant social interaction. When they get the chance to date and still feel like they can do their own thing, it is enjoyable for them. At the same time ISTP are often more focused on doing things in the moment, and so not being able to physically connect with someone can feel a bit unusual. ESTPs are not often fans of online dating, since they are much more focused on the physical world around them. The idea of having to meet someone online can feel insincere and unnatural for them. They often want to get to know people face to face or else they might struggle to really understand them and feel connected. ESTPs really aren’t people who are interested in online dating, since this can feel forced to them. ISFPs might enjoy getting to know people online, but at the same time they don’t want things to remain this way for long. ISFPs need to be able to connect with people in person to really know if they feel a closeness with them. They don’t easily connect with people if they have to talk with them through text, so this isn’t something that can really be kept up for too long. ISFPs often prefer to meet people in person, but they can actually be a bit nervous with new people. ESFPs are rarely the type of people who enjoy meeting others online. They are much more likely to connect with new people in person, or else they become distracted. They need to be able to get to know someone in person to see if they really feel a sincere connection with them. Online dating usually isn’t something they are drawn to, but that doesn’t mean they have judgements towards it. ESFPs usually want people to live their own lives and are perfectly accepting of what others choose to do in order to find romance.